The Florida Panhandle has a lot to offer, including some truly wonderful beaches that tend to be less crowded and more peaceful than many of Florida’s other coastline locations. Not far from Apalachicola, this little Florida Panhandle island is located in Franklin County and provides some truly breathtaking views of the Gulf of Mexico. The island runs for 28 miles in length and is inhabited, but has still retained a pristine, 'untouched' look to it. Two different lighthouses can be found on St. George Island, making this a nice spot to simply walk along the beach, admiring the views and snapping some photos. Swimming and kayaking are popular here too, and it's a good spot to fish. Nearby Dog Island is also a nice beach with low numbers of visitors, perfect for people who love their privacy and want to avoid the crowds. 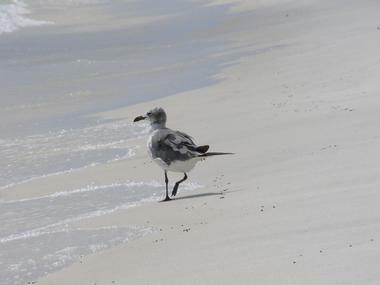 In one of the most northwesterly points in the state of Florida sits Perdido Key. The word 'Perdido' translates to 'Lost' in English, which seems to perfectly describe of this relatively little-known but breathtaking island. 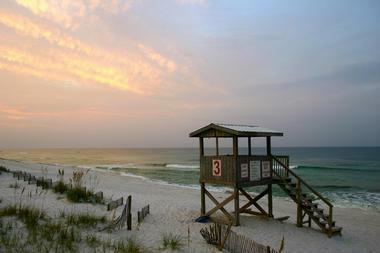 Perdido Key runs for around 16 miles and is conveniently located not far from the city of Pensacola. A lot of wildlife can be spotted here including sea turtles and lots of different sea birds, as well as the unique Perdido Key beach mouse, which is an endangered species of rodent that actually lives on the beach and is perfectly camouflaged to match with the color of the sand. 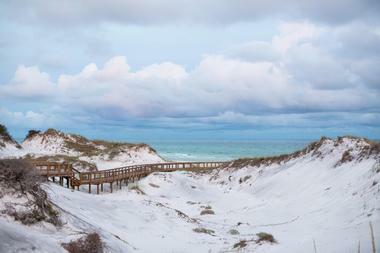 The beaches of Perdido Key feature some stunning sand dunes and miraculous views in all directions, and even more natural adventures can be enjoyed at the nearby Big Lagoon State Recreation Area. 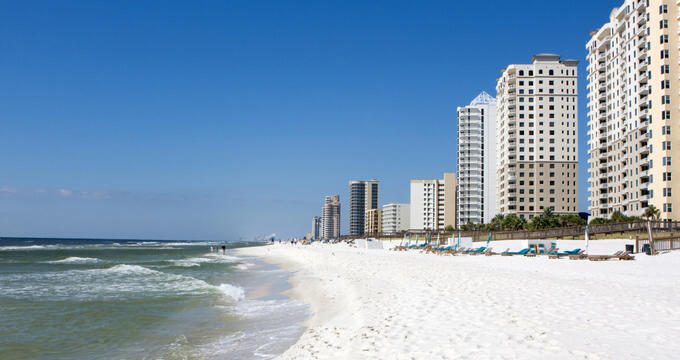 Panama City Beach is one of the top waterfront resorts on the Florida Panhandle. This city offers more than two dozen miles of stunning coastline and has a history of being a hugely popular Spring Break spot, but has calmed down over the years to become much more of a family-friendly destination at any time of year. The city itself has all kinds of amenities and fun spots to visit like the Pier Park shopping area and St. Andrews State Park, while the beaches at Panama City Beach are beyond beautiful. Lots of different activities are organized here too including scuba diving and wildlife boat tours. Beauty is a subjective issue and everyone has their views on what makes something beautiful, but it can be universally agreed that Santa Rosa Beach is quite simply one of the most gorgeous coastal locations in the world. On a sunny, Florida day with a bright blue sky and a gentle breeze in the air, there's nowhere quite like this Florida Panhandle beach. The sand here is so soft, white, and welcoming, it simply sinks beneath your feet as you walk along, and the coastal buildings are all nice and low so the scenery isn't spoiled in any way. Basic amenities can be found at this beach and it's an unbeatable spot for sunbathing and relaxation. Up in Santa Rosa County, Navarra is known as 'Florida's Best Kept Secret' and when you visit this stunning location, you'll quickly understand why. 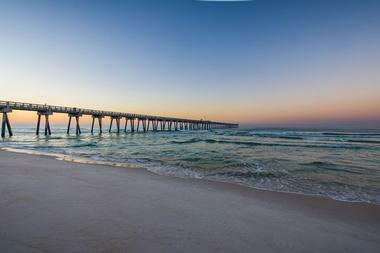 Highly popular with eco-tourists and nature-lovers, Navarre Beach is home to the longest fishing pier in all of Florida, as well as various other attractions along the Navarre Beach bridge like a duck pond, butterfly house, and play areas for children. Boating, surfing, fishing, and swimming can all be enjoyed on this Florida Panhandle beach, with canoeing and kayaking also being very popular here. Tourist numbers are going up at Navarre Beach, but the area is still relatively unknown, so you won't have to worry about big crowds or lots of noise on this Panhandle beach. Situated between Destin and Panama City, Grayton Beach is right by the Grayton Beach State Park and is a very family-friendly location with astonishing white sands and clear waters. The nearby historic village provides the perfect backdrop to a lazy day of beach relaxation, and Grayton Beach often ranks among the prettiest beaches not just in the Florida Panhandle, but in the whole of America, so it really is a must-visit location. Cycling, hiking, and kayaking can all be enjoyed in the nearby park. 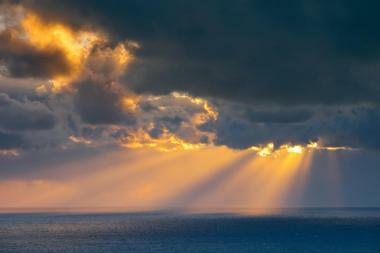 Florida, also known as the Sunshine State, is one of the most popular touristic locations in America. The state is perhaps best-known for its Disney World and Universal Studios theme parks, but there’s so much more to Florida than these family attractions. 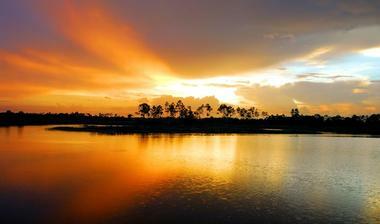 The Sunshine State is also home to incredible cities like Miami, Jacksonville, and Orlando, as well as playing host to all kinds of exciting and exotic wildlife like dolphins, manatees, alligators, and more. Florida is also known for its beaches. The Sunshine State has a longer coastline than any other contiguous state and also has some of the best weather of any state, so it’s a perfect place to pack up the car with some beach equipment and head out to enjoy the san, sea, and sun. Many people tend to head down to the Florida peninsula for the state’s best beaches around cities like Miami or Sarasota, but there are plenty of great beaches to be found on the Florida Panhandle too. Let’s take a closer look at some of them.